The NALCOM Synchro Zoom FTL 1000 mounts the powerful , wide-ranging 10x 6.5-65mm f1.8 shinkor zoom lens. This is the first zoom camea with lens interchangeability. The zoom lens may be dismounted and replaced with the aid of an adapter, a 35mm SLR still camera lens may be used. The camera also has the Synchro Zoom two-in-one system, which is exclusive to NALCOM. Here the moviemaker can do both operations by using a single finger for running the film and zooming the lens, by working only one button, which is for both operations. 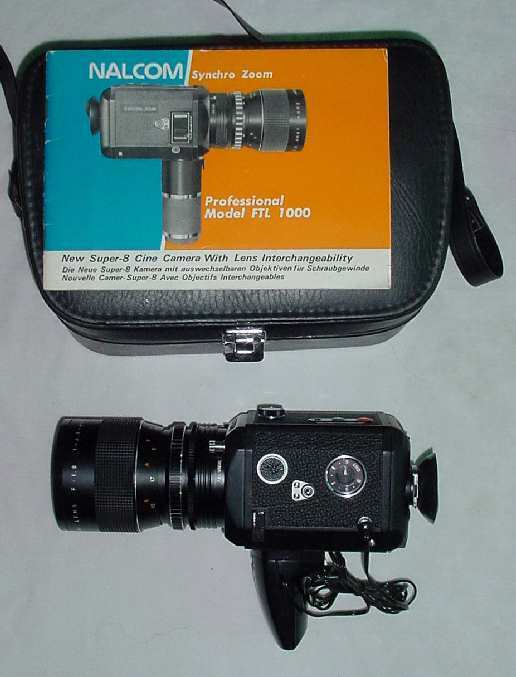 You can find more NALCOM FTL Synchro Zoom 1000 camera information on the Super 8 Wiki.